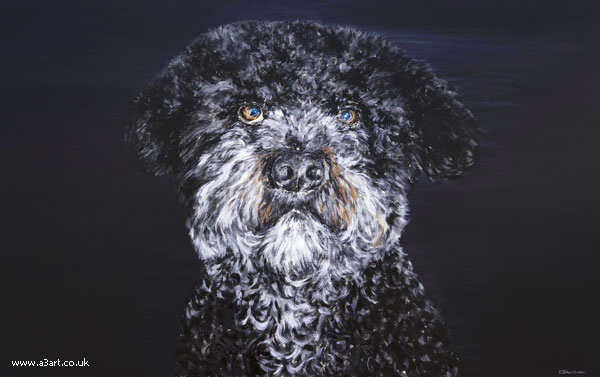 "This was a painting I had been promising myself I would paint for absolutely ages - a self-commissioned Pet Portrait of our much loved and adored rescue Spanish Water Dog 'Kat'. She really is the most amazing dog, so gentle and trusting and with her own fabulous character. She was an absolute delight to paint, with all that fluffy fur and those gorgeous curls; and those enigmatic and expressive eyes. This one is most definitely not for sale - it already has pride of place on the wall in our home."